One of the dishes I made for my postpartum nourishment is Sweet Potato Shepherd’s Pie. 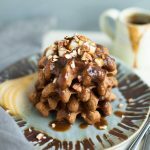 Not only was this dish a hit with all of my new-mommy clients, but every one of my other clients loved and often requested it too. I’m actually surprised I hadn’t shared it on SPS yet! 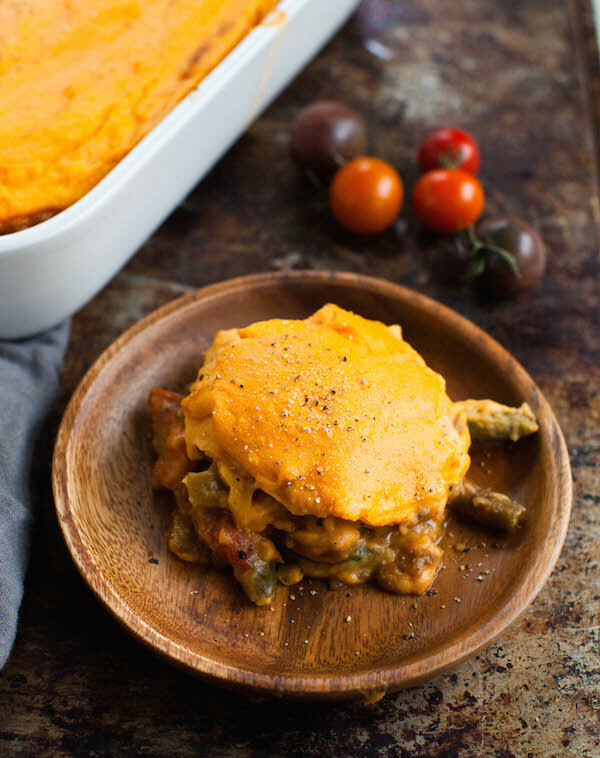 This hearty vegan Shepherd’s Pie is made with lentils, green beans, whipped yukon and sweet potatoes, and a delicious blend of spices. 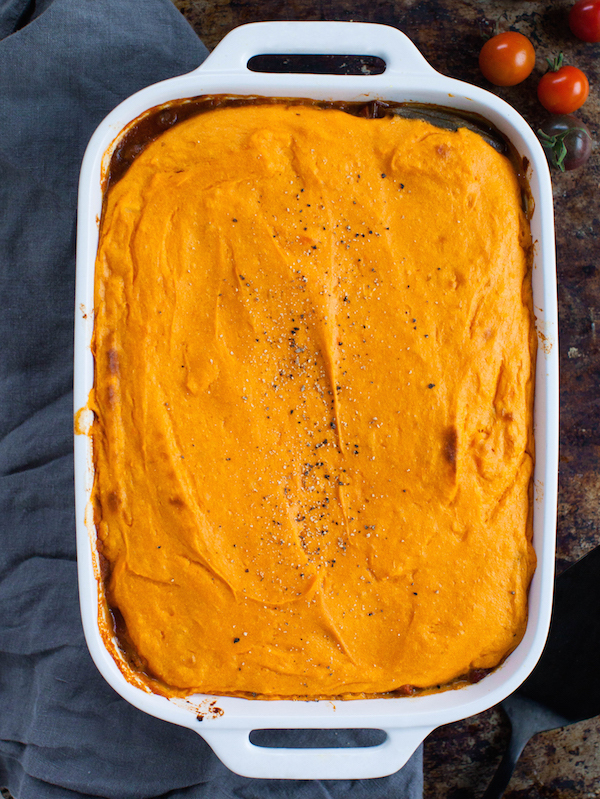 After giving birth it’s important to replenish the body with warming and mineral dense foods, so this Sweet Potato Shepherd’s Pie is perfect. 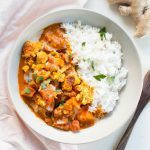 The lentils are full of iron and b vitamins, the sweet potatoes are full of vitamin A, potassium, and manganese, and since this is such a wholesome dish every other ingredient contains impressive nutrients as well. If you’ve seen any of my meal prep videos, you’ve seen how I like to multitask in the kitchen to save time and energy. One of my favorite ways to do this is to utilize a countertop oven. It won’t turn the whole kitchen into a sauna, and you can use it to cook grains, roast vegetables, bake, and broil. 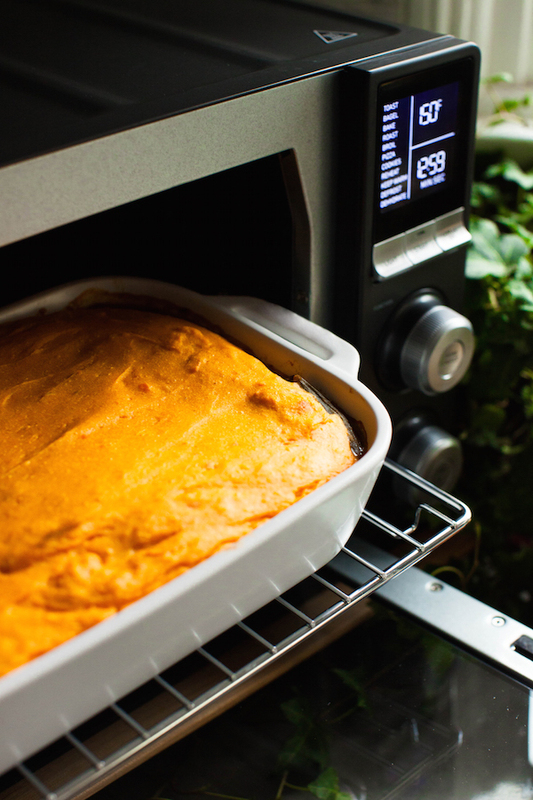 For this Sweet Potato Shepherd’s Pie I used the beautiful Calphalon Quartz Heat Countertop Oven to bake the casserole. It warms up quicker than any other countertop oven I’ve ever used, and delivers 40% more even and reliable heat thanks to its quartz heating element. Fancy, I know! 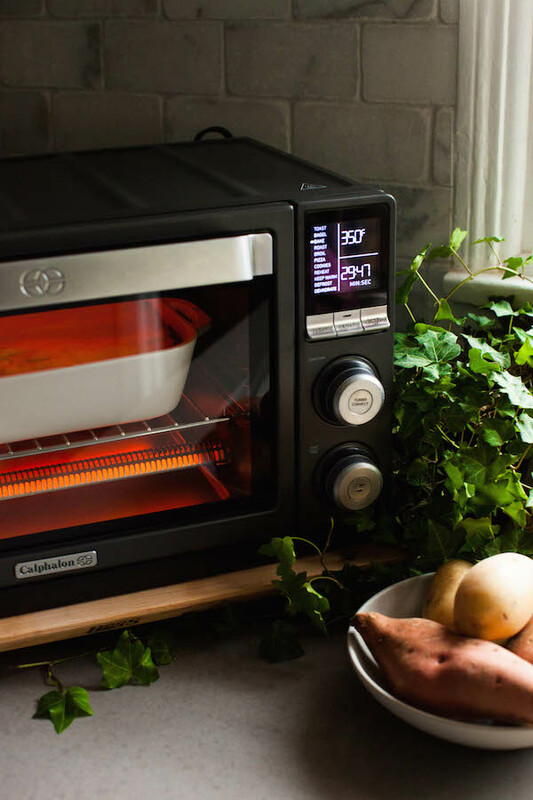 Using a countertop oven is so much more efficient and eco-friendly if you’re just baking/roasting one dish, and this one is spacious enough to fit even a large dish. One of the coolest features on this Quartz Heat Countertop Oven is the dehydrate setting! If you’ve followed SPS for a while you’ll know I used to love making dehydrated raw treats, but had to get rid of my bulky dehydrator because it took up too much space. I can’t wait to share more treats soon!! What are your favorite meals to prep and freeze? If you have any recommendations for balanced postpartum meals, please let me know those too!! As I said before, I've been making this recipe for many years, especially when I was a private chef in NYC. I feel like I adapted it from somewhere, but I cannot remember from where!! Place the peeled sweet potatoes and yukon potatoes into a large pot with 2 quarts of salted (use about 1 tablespoon) water. Bring to a simmer and cook until tender, about 20 minutes. Once tender, drain the water and place the pot back on the heat to evaporate any extra water under the potatoes for 30 seconds. Remove from heat and use a wire potato masher to mash. Add the apple cider vinegar, 1 tablespoon of grapeseed oil, soy milk, nutritional yeast, and salt, and mash again. Once the ingredients are incorporated, use a whisk to whip the potatoes until creamy. Set aside. * You can skip the mashing part and whip/blend the potatoes and ingredients in a food processor if you’d like a more pureed consistency. That’s what I did for the photos, but either works just fine. 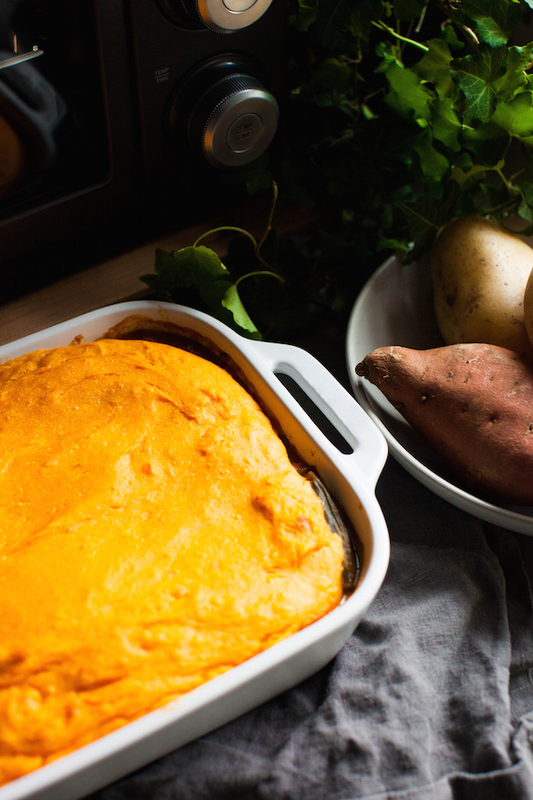 While the potatoes are boiling you can make the bottom layer of the sweet potato shepherd’s pie. Warm 2 tablespoons of grapeseed oil in a skillet on medium heat. Add the sliced onions, followed by a dash of salt. Sauté until translucent, then continue to cook them on medium-low to caramelize for about 15 minutes. Once the onions are slightly golden and tender add the celery, garlic, and carrots. Cook until the celery begins to soften, about 5 minutes. Add the lentils, diced yukon potato, thyme, and diced tomatoes, and stir well. 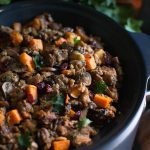 Place the lid onto the skillet and cook for 30 minutes, or until the lentils are tender. Add more water if necessary––1/4 cup at a time should be plenty if it begins to stick or burn. When the lentils are tender, add the green beans, cumin, soy sauce, and black pepper. Season with more soy sauce or salt to taste. Transfer the contents of the skillet to a baking dish (if your skillet is oven-safe you can leave it in there). Spread evenly onto the bottom of the baking dish, then top with the whipped potatoes. Preheat the Calphalon Quartz Heat Countertop Oven to 350°. Bake for 30-40 minutes, until the potato topping is slightly golden and dry.